Robert Downey Jr, Scooter Braun and the Los Angeles Kings were honored as heroes at Make-A-Wish Greater Los Angeles' 4th Annual Wishing Well Winter Gala on Wednesday evening at the Hollywood Palladium. Hosted by EXTRA’s Mario Lopez, this wish-filled evening was attended by Don Cheadle, Gavin Rossdale, Olympic gold medalist Laurie Hernandez, Rev. Jesse Jackson and included special performances by Tori Kelly, X Ambassadors and Bush. Over 700 entertainment executives, celebrities, athletes, top business executives, community and civic leaders, medical professionals and philanthropists came together, raising over $1 million to celebrate the children and families whose lives have been changed forever by the power of a wish. 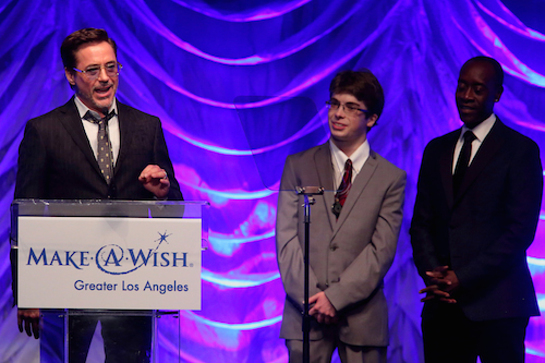 Oscar-nominated actor Don Cheadle and Wish Kid Cameron Fisch (now age 22) presented Robert Downey Jr. with the Shining Star Award for the dozens of wishes that he has granted to children around the world. Downey fulfilled Cameron’s wish five years ago when he invited the then 17-year-old, who has a nervous system disorder, to the movie set of The Avengers. Grammy-nominated singer Tori Kelly presented the Humanitarian Award to entertainment industry power broker and multimedia entrepreneur Scooter Braun. Scooter has granted hundreds of wishes for Make-A-Wish through his talent roster that includes Kelly, Justin Bieber and Ariana Grande, among others. Kelly later performed “Something Beautiful” from her debut album Unbreakable Smile, following a presentation by parents Theresa and Brian, whose five-year-old daughter Brylee’s wish to meet Tori was fulfilled before she passed away from cancer. In honor of the Los Angeles Kings longstanding partnership with Make-A-Wish, the team was presented with the first ever Power of a Wish Award by Wish Kids William (now age 12) and Tatiana (age 13). William’s wish to meet former Kings captain Dustin Brown was granted six years ago after the then six-year-old finished up his leukemia treatment. Tatiana, who has cystic fibrosis, attended the Kings’ Make-A-Wish Day last month and had her wish to attend the Olympics fulfilled this past summer. Accepting the award on the Kings’ behalf was COO Kelly Cheeseman. Players Tyler Toffoli and Tanner Pearson attended the Gala to represent the team. The Make-A-Wish Greater Los Angeles 4th Annual Wishing Well Winter Gala is proudly sponsored by: Presenting Sponsor: The Goldwin Foundation; Star Catchers Sponsors: Jacqueline M. Glass Family, Kennedy Wilson, Mattel, Inc., OneLegacy, Shegerian & Associates, The Walt Disney Company; Reception Sponsor: Security Benefit; Heroes Sponsors: AECOM, Artemis Real Estate Partners, CAA, Colony Capital, Drew & Jill Lawton, Eastdil Secured, Gibson Dunn & Crutcher, Hudson Pacific Properties, Integral Communities, Lockton Insurance Brokers, Mattel Children’s Hospital UCLA, Morgan Stanley Real Estate, Oaktree Capital Management, O’Melveny, Paul Hastings LLP, sbe, Skadden Arps Slate Meagher & Flom LLP, Wells Fargo, Woodridge Capital Partners, LLC.